We said our final goodbyes to our lovely machiya and took at cab to Kyoto Station to catch a shinkasen to Tokyo. After an uneventful 2.5 hour ride, we transferred to the Yamanote line for a few stops to get to Shinjuku Station. Our hotel web site said that the hotel was a mere 8 minute walk from Shinjuku Station so despite our luggage, we figured it would be easy to walk there. Our first mistake was that we didn’t know just how big Shinjuku Station is – as in the busiest train station in the world with over 2 millions people using it on a daily basis. We attempted to find the East exit as suggested by the hotel but somehow ended up in the New South exit. By now it was approaching 2PM and my lack of food was starting to become a problem. Thanks to Chris’ patience and Google Maps 30 minutes later we finally found our hotel. After a quick check-in and drop-off of our luggage, we hit the streets looking for food. One problem – almost everything was closed. We eventually ended up at a shop close to the hotel that specialized in tatoyaki. 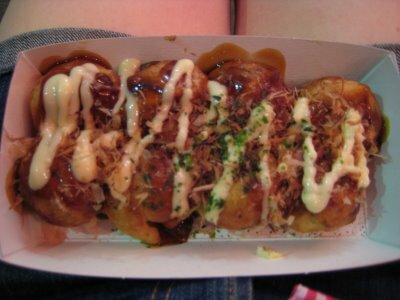 I vaguely remembered hearing that term before but it turned out to be octopus balls – no not those balls but rather a croquette type ball with chunks of cooked octopus. It was surprisingly tasty and with an ice cold Kirin, hit the spot for my tired, hungry body. Finally fed, we made a quick stroll around our neighborhood and discovered that we were right next to the famous Golden Gai, which is a series of interconnecting alleys that house 200 tiny (as in most seat 6-8 people) bars each with their own unique theme. None of course were open since it was in the middle of day but we made sure that would be our first stop later in the evening. After some more relaxation time, we made a short trip down the block to a restaurant called Seiyru, which had been there since 1858. It was a large cavernous restaurant filled with sallarymen drinking way too much sake and beer, and their disapproving girlfriends/wives. It was very amusing and the food – yakitori for Chris and noodle for me – was very good. We then looped back to the Golden Gai to start our exploration. I had read that a lot of the bars don’t let in foreigners or are private clubs. However, there were supposedly many that would welcome us. After a failed attempt of finding one bar that had been recommended, we came across Albatross, which I had read about in several guides. Fortunately, it was early in the evening so we were able to get seats around a very small, cramped table. 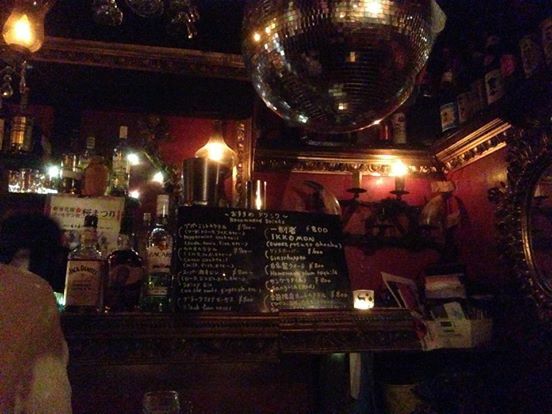 There was a 500 yen seat charge, but that is typical of the Golden Gai. There wasn’t a theme per se with the bar but the disco ball and the great deep house music made it a lot of fun. I saw they had Suntory on the menu for one of the whiskeys so I opted for that. Hey, it was only 600 yen so I figured why not? It tasted like, well, a 600 yen Scotch i.e. not great. Still, the music was fantastic and there was a very nice chill vibe to the place. We vowed to come back another time and made our way to the next bar. 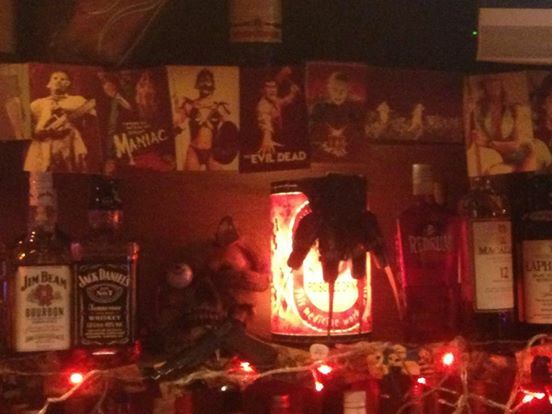 As you might guess from the picture above, this bar’s theme was horror – Death Match from Hell! Inside was horror fan’s ultimate tree house. The entire bar was stacked floor to ceiling with horror movie posters, trinkets, toys and other assorted props. Japanese death metal was the music choice and the flat screen TV was showing Fulci’s Zombi 2. There was no seat charge here so I opted to splurge a bit and get a bottle of sake. Sitting next to us was an expat from Ukraine who had been here for 4 years and an Aussie traveler who was amazed that I was drinking sake straight from the bottle. Both were extremely nice and I shared my sake with them in the spirit of the Golden Gai tradition. We needed to head out to Shibuya so we said our goodbyes and made plans to check out more of the Golden Gain in the nights ahead. Finally, it was time to go to the techno music club Mecca known as Womb. After an assist by two drunken but incredibly helpful sallarymen, we took the quick subway right to Shibuya Station. Right in front of the station is the world famous massive crosswalk, where seemingly hundreds of people pass each other on diagonal slants that somehow don’t end up in bodily injuries. The entire area was lit up with huge LED screens and flashing lights everything. THIS was the Tokyo I had imagined before coming here. We winded our way through a series of streets where “love hotels” were king and arrived at a large concrete building where Womb is located. After paying the 3500 yen entry fee, we were escorted into a large dark room throbbing with bass. One of the last remaining clubs to feature the fabled Phazon sound system, Womb is a destination for any serious clubber. The first thing that was readily apparent was that the crowd was decidedly more mixed with foreigners than anywhere else we had been. It reminded me a lot of the clubs in Ibiza in that sense as well as the up for anything vibe of it. We walked up a couple of levels, where other DJs were playing in side rooms, and watched the main floor from the top level. It was now a bit after 1AM and the main room was packed. We pushed our way to the center of the floor and got the full Phazon treatment with the deep bass vibrating all around us. As a fan of old skool clubs with dark, minimal lighting and no effin bottle service, I was in heaven. It was a local techno DJ spinning who seemed to have a dedicated following. I stayed glued to the dancefloor for the next 2 hours or so reveling in the spirit of this fantastic club. Still, the toll of travel and all of the walking we had done began to mount and it was time to go. Amazingly, he got us back to the hotel, which is located on the edge of Tokyo’s red light district. Since it was well past the witching hour, the scene by our hotel had become quite different but very amusing. We passed by a couple of touts (people trying to get you to come into various go go bars) and made the short walk back to the hotel. Another long day/night lay ahead so it was time for some sleep. Posted on April 5, 2014 by reyalto. Bookmark the permalink.